When it comes to laundry, it's best to use a brand that will get the job done correctly the first time. That brand needs to be at the top of its game and able to fight through tough stains and grime with ease. Many fall short of this task, while only a handful can call themselves true laundry champions. 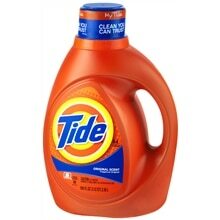 I've always viewed Tide as the most premium of laundry detergent brands and many will agree with me. It's important to me that my clothes come out looking excellent each time. Tide never lets me down. Tide allows you to enter into the bright and magical world of clean clothing. Tide has been making consumers happy since 1946 with their laundry detergent. Fast forward many decades later and you'll see different varieties of Tide products lining your drugstore shelves. If you want diversion from original Tide, how about Tide with a touch of Downy, Tide Free, Tide with Febreze freshness, or even Tide with bleach alternative? This is just to name a few of Tide's children! My clothes have been introduced to Tide for years now and they always enjoy the meet-up. If you're looking for unparalleled results, please turn to Tide. Recently, Tide has partnered with Oxiclean to produce a new Tide Oxi multi-purpose stain remover. Go ahead and give those spring clothes you had stored away a brilliant clean so you can look your best this season. This true multi-purpose cleaner features the amazing cleaning power of Tide to fight stains. When used as an additive to detergent, it provides better stain removal and brightens whites and colors without hurting them. The best part about this stain remover is that it's multi-purpose. So, while you can use it on your clothes, you can also use it to fight household stains on carpets and upholstery. It's also ideal for tile and grout, bathtubs, and outdoor furniture! How's that for a product with many uses? Stains, don't even think about it. I had the fantastic opportunity to try both Tide Original, and the new stain remover. Just a day prior to receiving the package, I had gotten a chocolate stain on my shirt. Chocolate isn't the easiest stain to remove, so I was not thrilled about it. Fortunately with Tide to my rescue, the stain would be kicked to the curb. Laundry day arrived and I threw everyone into the machine. I added the Tide original and the stain remover. I could hear all of the clothes talking to each other and getting re-acquainted. Once the washing cycle was done, I went to switch them to the dryer. As soon as I opened the washing machine top, I was hit with the fragrance of Tide. My nose smiled, the stars aligned, the world was perfect. Tide truly makes you happy. I checked on the shirt with the stain and it was completely gone. I knew that Tide would have no problem fighting it. I've gotten chocolate stains before where the stain was removed 50%, but not all the way. Tide and the stain removal kicked it to the curb! As always, I am thrilled with Tide. No longer will I continue to worry everytime I get a stain and wonder will this one be unremovable? I know that with Tide's power in my future, stains are no match. I also look forward to using the stain remover on my tile and grout. I highly recommend Tide and its products. Your household will thank you. My son comes home from work with dirty clothes. i have young children who are always getting their clothes messy. My clothes need this because my normal stain pre-treater is just not cutting it. Need this for my husbands work clothes! We always pre-treat the stains. This is great to be able to have something that makes it so we don't have too. I could use this to deal with stains in the laundry. both my kiddos do baseball and ride horses the clothes come home so satined and i soak and pre treat but it never seems to work. id try anything! My clothes need this because I have a messy husband. We have 3 kids at home,so we definitely need this! I could really use this. My husband and son love to go fishing and when they come home they are really dirty. This would be great to clean their clothes with. I would love to be able to get the grass stains out of my kids clothes. My hubby is a maintenance worker---I have stains upon stains. My family never remembers to tell me when they stain something, so many times it goes into the wash without pretreating. My dad is such a messy eater. As he ages he seems to care less and about what ends up on him when he eats. This would be very helpful in keeping his clothes clean. i would love to try this because i work on a machine and grease gets on my shirts. i would love to see if it would work to take the grease out. i need this b/c of my guy. his clothes are covered in concrete,paint,glue and numerous other mystery stains. My husband is always coming home with stains on his clothes so I would love to try this. My mom is always getting stains on her clothes from cooking (she always forgets to wear an apron). I need this because some of my clothes are stain and pre-treating is not working. I could really use this new Tide. There are so many different stains on our clothes that are hard to get out. I have 2 kids under 3...I think that says everything! My son comes home with dirt from his job that just won't come out unless I spray it with stain remover and let it sit for a couple of days. I have a little boy who just seems to attract the dirt to him no matter where he goes!! My son does lots of yard work and gardening. Nuff said? I work in EMS I deal with body fluids daily!. I work in the restaurant, which means my cloths get stained often! I need some tide! My family is always getting stains on their clothes. We get a lot of stains. I have a four year old and six year old...food, mud, grass, boo boos...enough said! my son loves to play outside in the mud!! My husbands clothes are always stained. He works with chemicals and grease. My family is always a mess! I would love to try this for my husbands clothing. He comes home with oily and greasy clothes everyday. It is hard to get this off his clothing. Would love to try a good stain remover. My family's clothes need the new Tide Oxi multi-purpose stain remover because we are active both inside cooking and outside in the yard. We make lots of messes on our clothing. Hubby is a tree climber and comes home sweaty and smelling like gasoline and oil.. I would like this to help with my son's clothing! My clothes need this, because I am a clumsy slob, who drops every bit of food onto my clothes. I have 3 young daughters who constantly get stains on their clothes! I would love to give this a shot. I need this since my clothes are always messy. As a nurse, I have some weird, gross stains on my clothes! I'd love to try this to get them out! between my husbands military unforms, pt clothes and kids play clothes i need some serious help! my bf does floor refinishing and clothes needhelp! My husband works at a fine dining restaurant. Wine stains are the worst! my clothes need this because they have stubborn stains on them. my kids clothes need this because they always stain up their school clothes during lunch time. I work a lot with dirt, and dirt tends to like my clothes a little too much. I need it for hard stains and bleach just messed up your clothes! My clothes need this because they need to be extra clean. my clothes need this because we get a lot of stains that i would love to get out. this would be great for my daughters clothes! We need this because our clothes gets all kinds of stains. The biggest are red mud and grass stains. Thanks for the giveaway…our kids seem to attract stains ! I need this because: I have a hubby that works way too many hours per week at a shipyard, a toddler, four dogs and a cat. I have more stains on clothes then i care to admit lol.